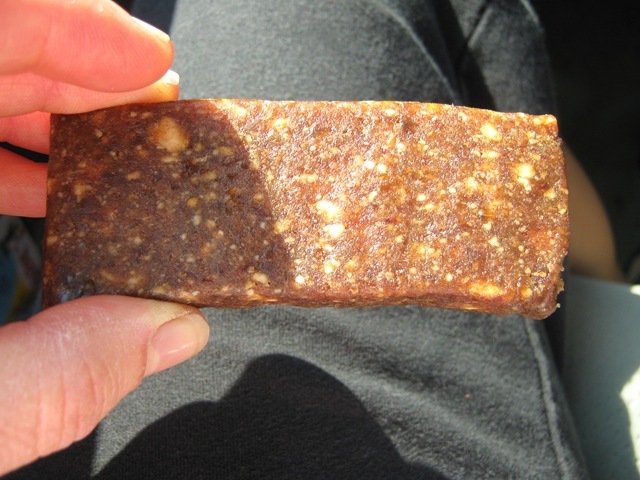 I wrote in my new Examiner post yesterday about Think Thin & Think Fruit Bars. They are on sale at Kroger this week for $1/each! That is 50% off!! I stocked up, as I know the Think Thin Bars are great to have on hand in a situation where there is no safe food available for Jon. They don’t replace a meal for him, he is a growing boy, but they do hold him over with the 20g of protein they have per bar. 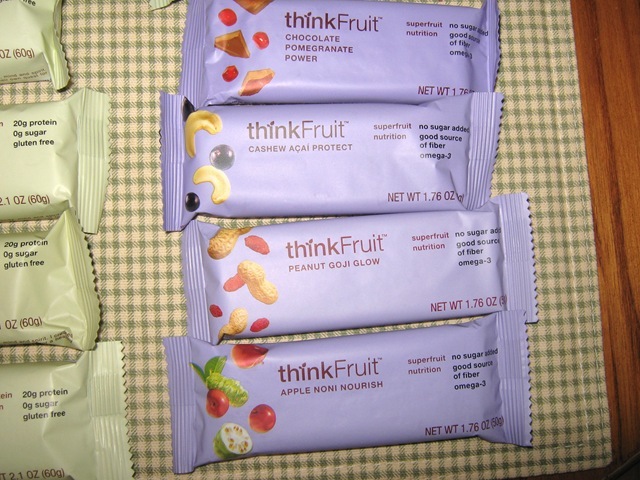 I bought some Think Fruit Bars for myself and gave the Cashew Acai Protect bar a try today. I was very impressed! These taste very similar, if not the same, as Lara Bars! The bar had a great flavor & texture. It was full of nuts and has 160 mg of Omega 3s per serving! They are dairy & gluten-free. This bar has only 8g of fat, as compared with Lara Bars, which have 10+ grams of fat. The fat is coming from nuts, so not a bad thing. The bar has 190 calories, 6 grams of fiber and 3g of protein. The regular price on these bars at Kroger is $2/each, which is a little steep, in my opinion. I don’t mind paying between $1 – $1.50 for bars like this. I would recommend this bar. 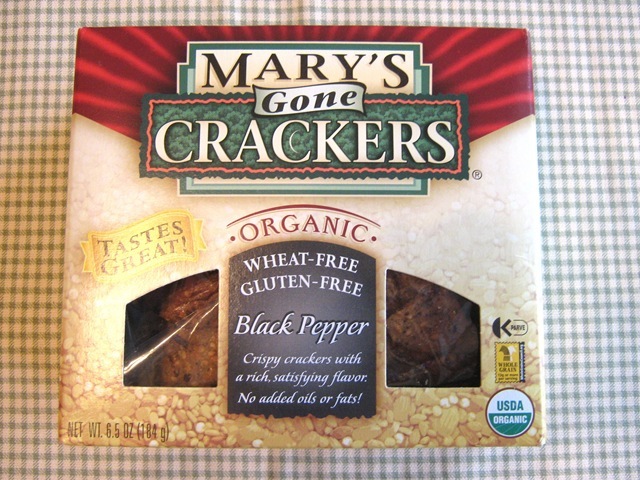 🙂 Another great go-to product for those on a gluten-free diet. 1. Leave a comment here telling me why you would like to win. 2. Blog & link back or tweet about this contest & leave another comment telling me you did. 3. That is it! Have fun! The contest is open until midnight tomorrow night, August 7, 2009. The winner will be chosen and announced on Saturday AM. Today my baby girl is 7 years old. 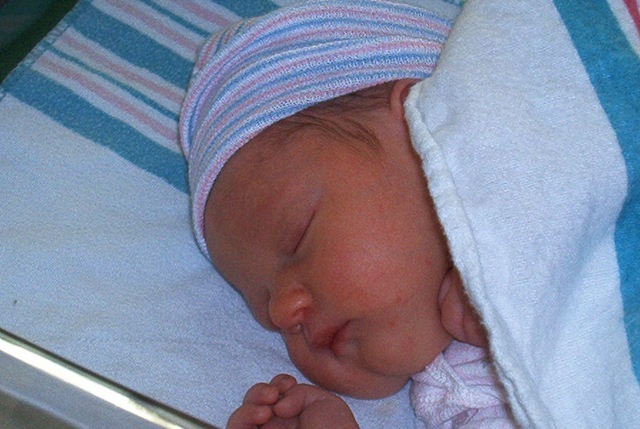 She was born on August 6, 2002 at 1:17 P.M. I can’t believe that she is going into second grade! Time sure does fly by. 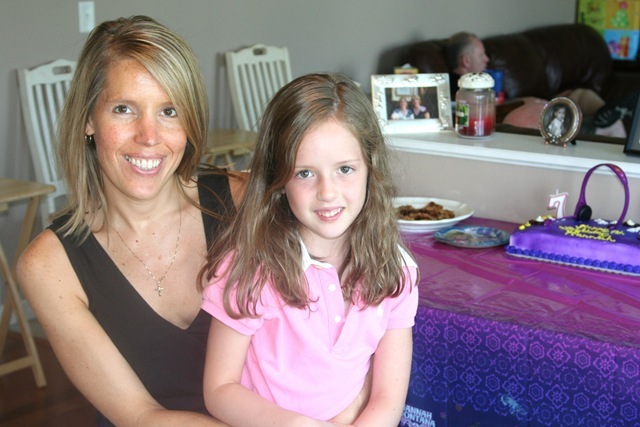 Hannah had a wonderful family cookout this past weekend and has a party set up for 5 of her closest gals this weekend. Talk about having a birthday week!! Today she is having her buddy, Regan (who is also my youngest sister, 7, and Hannah’s Aunt….got all that? ), spend the night. We asked Hannah to choose the menu and she chose Pizza Hut. Not exactly gluten-free, so Jon & I will make our own pizza. We will most likely hit up Cold Stone Creamery for some yummy desserts. Here is a picture of Hannah on her “birth”day. Here she is with me just this past weekend before her party. Happy birthday, sweetie! We love you!